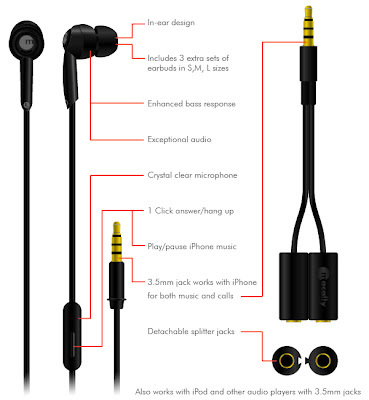 If you find the supplied earphones for Google's Nexus 1 phone uncomfortable, you can try these from Macally. Intended for use with an iPhone / iTouch, they work nicely with the Nexus. The mic works, as does the answer / hang up / play / pause button. As an added bonus they have a splitter so two people can listen to the same Nexus. A bargain at $19.99 suggested retail or the $15.99 I picked mine up for in Fry's.